The City of Huntington’s Public Works Department, in partnership with the Cabell-Huntington Health Department and Huntington Police Department, will conduct an alley sweep in the West End neighborhood Nov. 1, 2 and 3. The sweep will cover every alley within the boundaries of Virginia Avenue to Van Buren Avenue and 9th Street West to 14th Street West. Residents living in this area are encouraged to set out trash in the alleys before Nov. 1. Work will also include cutting back trees and weeds from alleyways, citing vehicles that have been abandoned or don’t have proper registration, and issuing code enforcement citations for unkempt properties. The Public Works Department places an added emphasis on cleaning alleys in the fall as the grass-cutting season winds down and resources become more available, Public Works Director Jim Insco said. 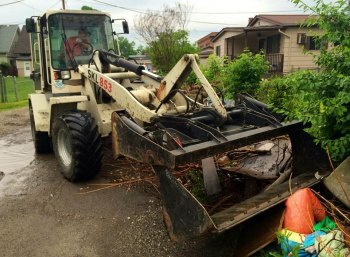 The Public Works Department will typically work with City Council members and neighborhood associations to coordinate and schedule alley sweeps. This will be the second alley sweep this fall. The Public Works coordinated an alley sweep in Fairfield earlier this month. For more information about the alley sweep in the West End or about how to organize one in your neighborhood, call the Public Works Department at 304-696-5903.